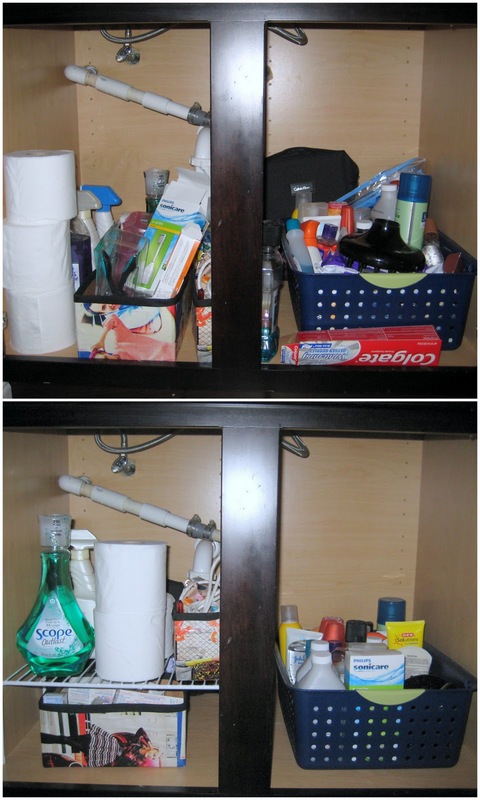 Under the bathroon sink organization - C.R.A.F.T. I’ve been on an organizing frenzy. Check out the junk drawer and under the kitchen sink. I love these things…$6.33 only at Lowes. Here is a close up and an HERE is an earlier attempt to organize under the sink. All of the stuff…who would have guessed we have 4 things of sunscreen, 2 nail polish removals, 3 rubbing alcohols, and 2 mouth washes! White shelf= organization miracle. Thank you Lowes. Love the organization, makes you ready to tackle anything the day throws at you! I have recently been in both Home Depot and Lowes looking for organization-type items for our new home and I have to say that Lowes sure beats Home Depot hands down in this category. I was surprised by all the neat items they had (especially for the kitchen, pantry and closets). I can't wait to get started! Thanks for the inspiration, I shall start with my bathroom! how brave of you to reveal the 'before' to us!